Timothy Baghurst is an Associate Professor of Physical Education at Oklahoma State University, US. He teaches in the disciplines of physical education, coaching science, fitness and skills testing in PETE programs, and ethics in sport. Over the years he has acquired a multidisciplinary background that includes teaching and coaching at the junior and high school levels and has studied and worked at several different universities both in the United States and internationally. He has published more than a dozen peer reviewed articles, has made national and international presentations, and serves as a peer reviewer for several journals. In 2016 he was selected as a Research Fellow of SHAPE (Society of Health and Physical Educators) America. Anthony Parish is Doctoral Fellow of Kinesiology with an emphasis in Pedagogy at the University of Arkansas, US. Before working on his doctorate, he received a masters degree from Columbia University in Bio-behavioral Science. 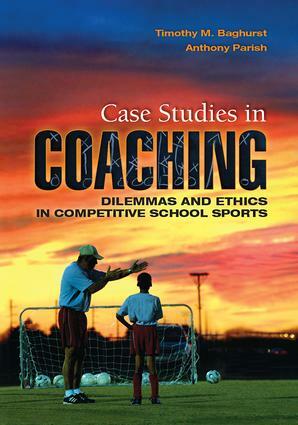 He teaches a variety of disciplines in physical education, coaching science, and health. He has more than 10 years of teaching experience at all educational levels and has coached several different sports. He has also worked as a strength and training coordinator and as a certified personal trainer. In addition, he is a former competitive bodybuilder.